Easter is over, winter is receding into the distance and Term 3 is rushing by. If you have a dissertation or thesis to complete this can be the time of year when things start to get really serious. Central to your dissertation is a good understanding of the subject area and the related knowledge around it. Indeed most of the time you have to prove that you have this by writing a literature review of some kind. Ultimately this means reading, often a lot of reading. Most subject areas that have existed for more than a decade have generated acres of books and papers explaining, debating, and occasionally eviscerating them (and those that don’t will often be developing so quickly that you will have to read a lot simply to keep up). For some of the text heavy disciplines this can give you a bibliography of dozens or even hundreds of items. How do you even begin to deal with something like that? Here are a few tips to help ease the process a little. Plan your reading: It can feel like you need to read everything even loosely related to your subject, but, as you have a limited amount of time and might need to sleep at some point, it makes sense to think carefully about what you really need to read. Reading abstracts where available, skimming introductions and reading reviews are all ways that you can get a sense of how important this material may be for your project. Do you really need to read the entire thing closely or can you skim read the key arguments? I kept two reading lists, one for key readings and one for stuff that I needed to be aware of. Deciding which to do can save you a lot of unnecessary late nights. Speed reading: This isn’t some obscure SU sports club. Speed reading is a technique that allows you to very quickly read large amounts of information. While this isn’t the best thing to do for the key texts in your research area, it can be very useful for working through large numbers of papers. Student Careers and Skills run workshops on the technique and have an online tips sheet here to get you started. Note taking: Sounds obvious but don’t underestimate the importance of good note-taking. How you take notes is very much a personal decision. Maybe you like making handwritten notes with brightly coloured pens. Maybe you prefer using Word or note taking programmes such as Evernote. Whatever you use make sure you keep a backup! When you’re reading it’s usually best to finish reading a section before making notes about it so that you can get a good sense of the key points of the passage before writing. 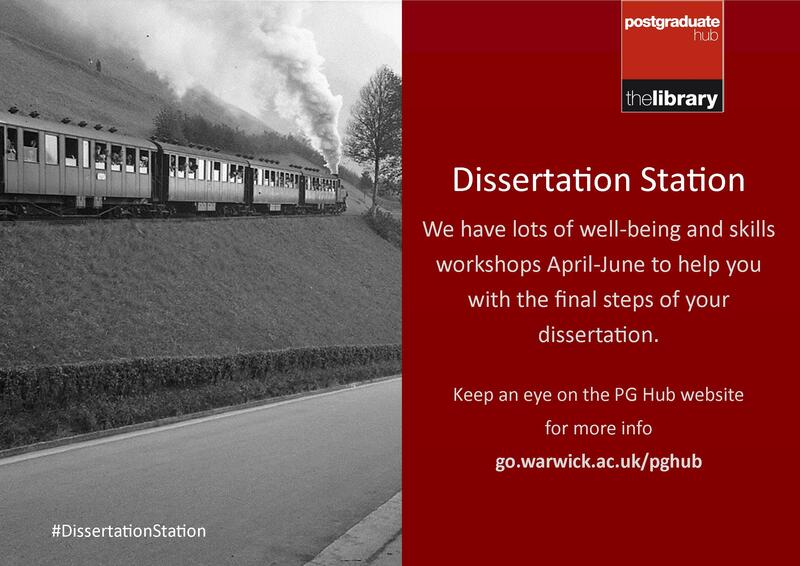 Extra resources: There are a whole range of resources that can help you get through the dissertation. The PG Hub offers all kinds of support to keep you on track (and maintain your sanity). Struggling to find the right environment to plough through your reading? Try Shut Up & Work, which keeps you motivated and productive. The Student Careers and Skills team also offers a range of workshops, resources and materials which can help. Staring at a reading list or desk piled high with books it can sometimes make you feel as though the amount of reading you have to do is impossible. But ultimately, it’s just more of the work you’ve been doing to get to this point. Don’t forget that completing a dissertation is an experience that everyone goes through and as someone who’s been there and done it, I can definitely say that using the techniques listed above can make the process at lot less painful and your dissertation will be stronger for it. There are all sorts of tips and ideas to help you maximize your reading time, what are yours?